Kyrgyzstan is a landlocked country of mountain valleys, glittering lakes and felt yurts. Bordering Kazakhstan, China, Tajikistan and Uzbekistan, the Tian Shan mountain system covers over 80% of the country. The Kyrgyz economy was severely affected by the collapse of the Soviet Union and the resulting loss of its vast market. Now, revived interest in traditional handicrafts after years of Soviet suppression has led to the creation of projects that provide much need income to village women and their families. 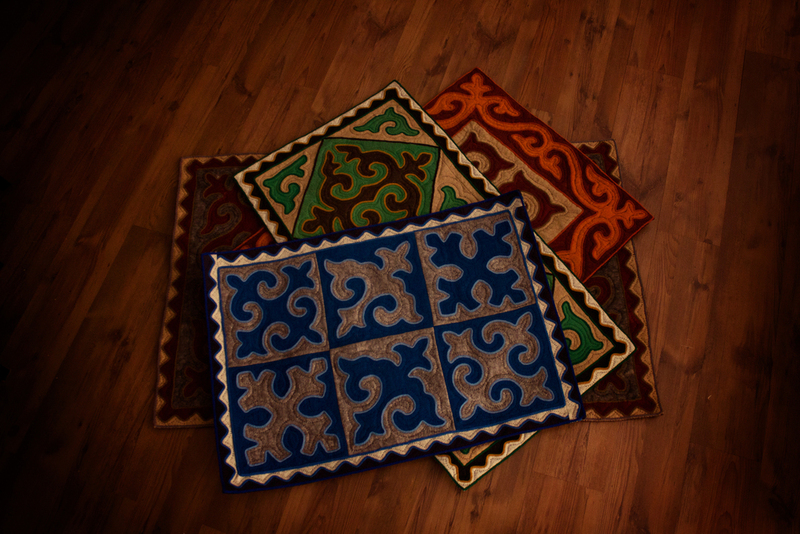 Shyrdak rugs are traditionally made by women. Two or more contrasting layers of felt are laid on top of one another and a pattern is then marked on the top layer in chalk. This creates a stunning positive/negative style visual image usually full of symbolic motif images that represent the natural world. The felt that is cut from the top layer is not wasted and is used to create another mirror image shyrdak with the reverse colours of the original. Mariam Omurzakova was the founding Executive Director of the Atlyn Kor Women’s Handicraft Cooperative.The mission of Atlyn Kor of is to provide income to the local felt artisans of the Kochkor Region and thus carry on Kyrgyz culture and traditions for generations to come. AIDAI Designs is a social enterprise venture featuring the designs of a talented young woman from Bishkek, Aidai Asangulova. The daughter of a Kyrgyz yurt maker, Aidai’s work combines traditional techniques with a modern design aesthetic, creating elegant products that seamlessly weave together the old and the new. Aidai’s beautiful and unique scarves, made from silk and felt, are hand rolled and fused into one-of-a-kind textiles.